Maximum size: about 35 mm. Identification: This is a mustard-yellow animal minutely flecked with brown. There are clusters of white flecks on the papillae and gills. There are three pairs of enlarged, pink-tipped papillae on the sides of the notum with the posterior pair having greatly inflated, hemispherical tips. There is a tall dorsal crest on the anterior portion of the notum that is fringed with fine papillae. Distribution: Maui: Plocamopherus imperialis is known from New South Wales and New Zealand with related animals in Japan and elsewhere. Taxonomic notes: The over-all form and color are similar to some photos of P. imperialis from elsewhere in the Indo-Pacific. But, there's enough uncertainty regarding which animals are included in that species that we've opted to use "cf." 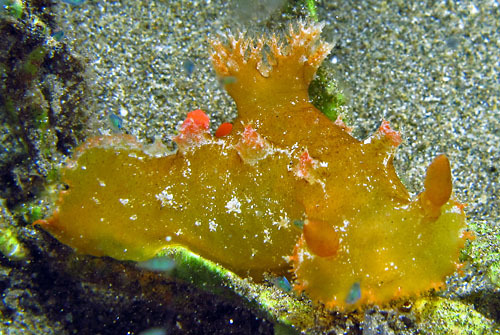 It was first recorded in Hawaii from Maalaea Bay, Maui by Katherine Shepherd on Dec. 16, 2012. Photo: Katherine Shepherd: about 35 mm: Maalaea Bay, Maui; Dec. 16, 2012. Note 1: Katherine stated that she observed it attempting to swim in the field.